Without Terry Hershey, there likely would be no Buffalo Bayou to save today. One of Houston’s most influential conservationists, in the mid-1960s Terry Hershey rallied garden club members and Junior Leaguers, business and political leaders, including Save Buffalo Bayou founding president Frank C. Smith Jr., George Mitchell, George H.W. Bush, and others. Together they stopped the Harris County Flood Control District and the Army Corps of Engineers from stripping and straightening Buffalo Bayou and covering it in concrete all the way from Addicks and Barker dams through Memorial Park to the Shepherd Bridge. Our beautiful 18,000-year-old Mother Bayou would have been a dead, shadeless river like Brays and White Oak. A brutal concrete ditch. Hershey died Thursday, Jan. 19, her birthday, at her home near the bayou. “Terry was just an enthusiastic, charismatic person who persuaded all of us we needed to save the world,” said Frank Smith recently. But Buffalo Bayou is never safe from the bulldozers, as we found out when the flood control district once again began making plans around 2010 to strip, dredge, and reroute one of the last natural stretches of the bayou as it passes by Memorial Park. Even now our political leaders are calling for bulldozing, widening and deepening our bayous and waterways in a misguided response to flooding. We must always remain vigilant, warned Hershey more than thirty years ago. Watch this documentary film of Hershey and others talking about Buffalo Bayou. Called Last Stand of the Buffalo, it was made in 1984 by KUHT. In honor of Terry Hershey, listen to the River Oaks Chamber Orchestra playing Brad Sayles’ Buffalo Bayou Suite. And here is an interview with Terry Hershey conducted by environmentalist Ann Hamilton in 2008. From the Houston Public Library’s Oral History Project. 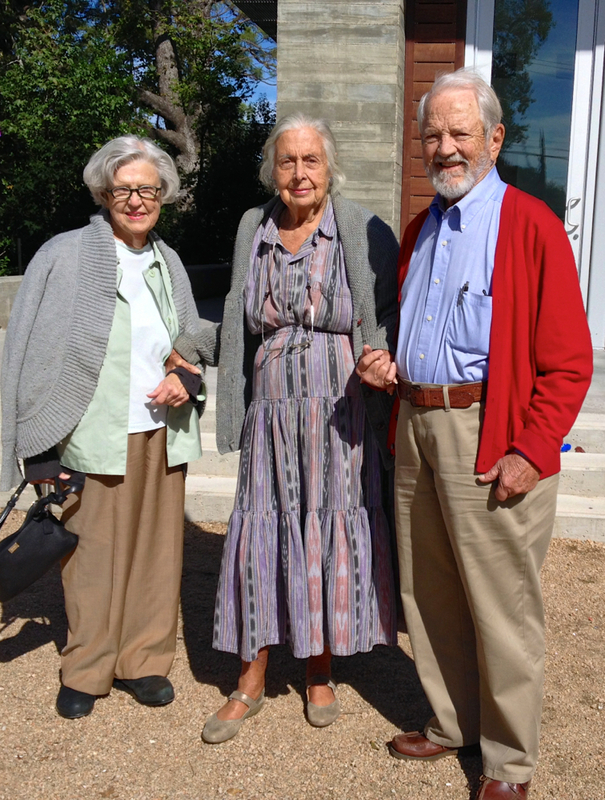 Avon Smith Duson, Terry Hershey, and Save Buffalo Bayou Board President Frank Smith, August 2016. 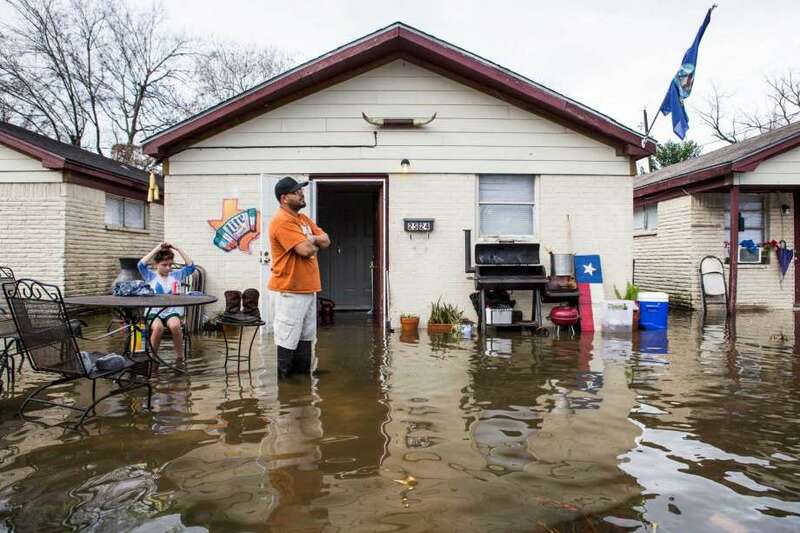 A Houston group called Citizens Solutions to Flooding is circulating a petition calling for the creation of a long-overdue Houston-Galveston regional body to ensure that new construction and development does not increase flooding. The petition focuses on the inadequacy and lack of enforcement of current regulations regarding stormwater drainage and detention. It calls for transparency in the permitting process and financial incentives for property owners to retrofit properties to conform to more effective standards for controlling stormwater running off impervious surface. Houston’s natural tendency to flood has been greatly worsened by uncontrolled development and the proliferation of hard surface like parking lots, building rooftops, and roadways that rapidly collect and concentrate rainwater rather than slowing, absorbing, and dispersing it. In calling for regional oversight, the petition notes that “watersheds know no county boundaries.” And development in one watershed can worsen flooding in another watershed. Notably, the petition does not call for widening and deepening our bayous and streams, an outmoded, costly, ineffective, and environmentally damaging solution preferred by city and county engineers. More green space, not less, is the consensus of leading experts, including Phil Bedient, director of the SSPEED storm center at Rice University. 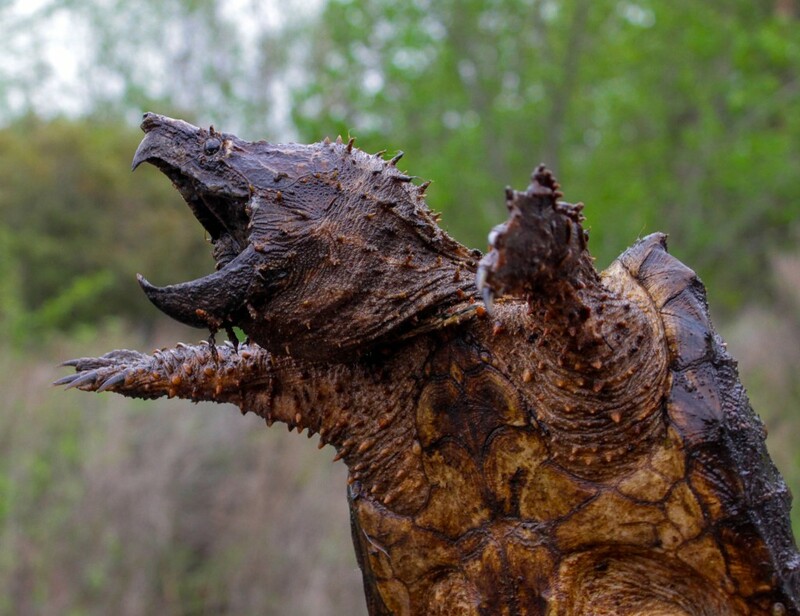 Angry alligator snapping turtle, a threatened species living on Buffalo Bayou. Photo by Ashley Tubbs. There is still time to register for a February symposium in Houston on urban riparian areas — those special zones of trees and plants along stream banks so important for clean water, flood and erosion control, and wildlife. The Texas Riparian Association has organized a three-day conference Feb. 15-17 largely directed at natural resource professionals but useful to anyone interested in the health of our urban bayous and creeks flowing into Galveston Bay. Yellow-crowned night heron by Frank X. Tolbert 2. Save Buffalo Bayou is a co-sponsor of the event, titled “Balancing the Challenges of Healthy Urban Streams,” to be held at Rice University’s BioScience Research Collaborative (BRC), 6500 Main Street. The registration deadline is Feb. 8. To register or find out more info, click here. Helm and Save Buffalo Bayou will also be offering float trips on Buffalo Bayou past Memorial Park and into Buffalo Bayou Park in the middle of Houston to symposium participants. The three-hour trips take place Friday afternoon from 1:30 p.m. to 4:30 p.m. and Saturday morning starting at 10 a.m. Cost is $50 per person. For more info or to reserve a place, contact Tom Helm. Among other topics to be addressed: daylighting buried urban streams, the capacity of Houston’s urban forest to cleanse polluted stormwater, the economics of using natural drainage systems in development, how Austin protects riparian areas, incorporating the value of ecosystem services into regional policy decisions, managing large woody debris in urban streams, and more. 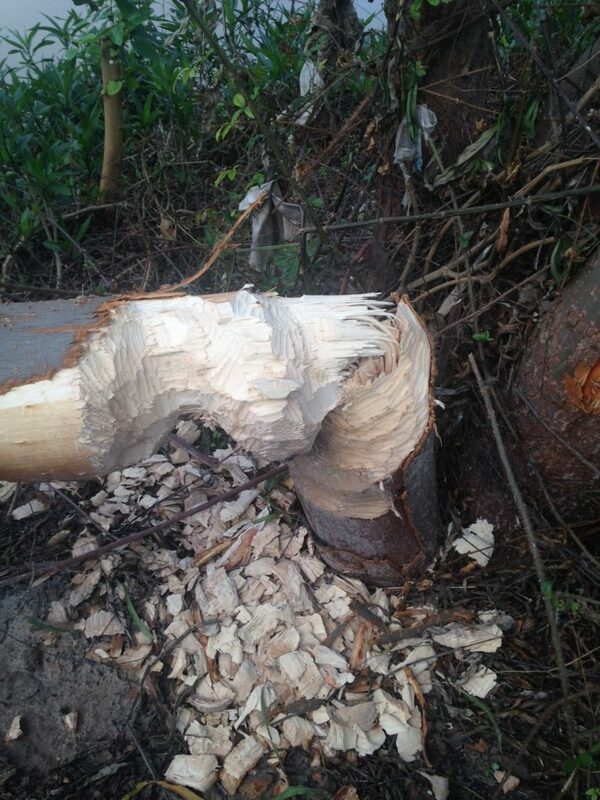 Reader Thomas Jackson sent in this photo of the handiwork, or we should say, toothwork, of beavers, or a beaver, on a tree on Buffalo Bayou downtown. Jackson took the photo on the bank across from the University of Houston Downtown. He was surprised to find beavers at work downtown. Bodson should know. He’s also the new executive director of Galveston Baykeeper, a nonprofit organization working to ensure that every waterway is swimmable, fishable, and drinkable. We also think the top part of the tree is the tastiest. Thanks for the photo, Thomas Jackson.